Postpartum depression is an umbrella term which encompasses several mood disorders that follow childbirth as quoted by a study review conducted by Sara and co-researchers in the year 2009. Depression refers to single or multiple mood disorders that lead to persistent sadness or uninterested behavior. “Major depression” is a term that refers to a depression state that creates a negative impact on the thoughts and feelings and in turn the decisions and behavioral changes in response. 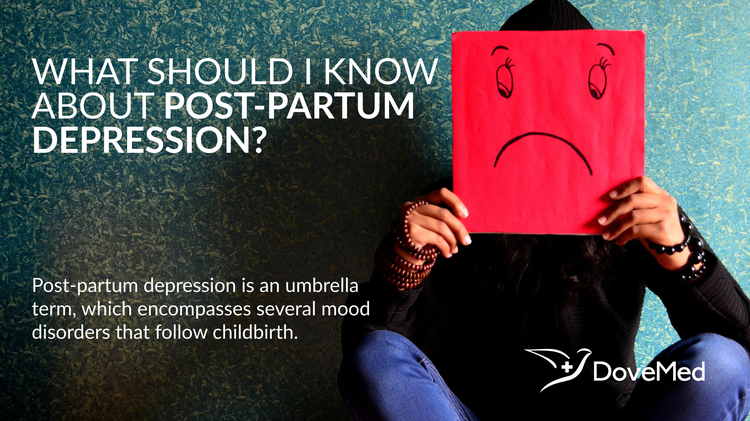 Postpartum depression is an umbrella term which encompasses several mood disorders that follow childbirth as quoted by a study review conducted by Sara and co-researchers in the year 2009. Moses-Kolko and co-authors through a 2004 study reported that postpartum depression is one of the most common psychiatric disorders seen amongst women after pregnancy; yet it remains extremely under-diagnosed. The study also evinced that the depression seems greater during the first annual postpartum. Often postpartum depression can be confused with baby blues, postpartum panic disorder, postpartum obsessive-compulsive disorder (PPOCD), post-traumatic stress disorder (PTSD), and postpartum psychosis (PPP), on account of being manifested similarly, or due to their set of overlapping symptoms. Depression and stress tend to lower brain volumes and protective proteins that are responsible for enabling synapse formations and neuronal growth. Hence, when an antidepressant drug is prescribed, its role in the body is to promote protein availability and function and increase brain volume to reverse the depression and stressed states, as reported by Sara and team in a 2009 study. Dietz and co-authors (2007) demonstrated through their research that initial postpartum symptoms are usually observed during the end-stage of pregnancy or around the labor period. The need and demand for emotional attention is high at this point in time. When four or more collective symptoms are observed within the first four weeks of delivery in a new mother that lasts each day for at least a two weeks period, postpartum depression of any form can be confirmed. Normal infant developments may be negatively influenced due the mother feeling depressed. A good time to screen vulnerability to postpartum depression is during prenatal periods, especially when a previous history of depression has been faced by the mother-to-be. During pregnancy too, screening can help predict depression chances after the child’s birth and postpartum onset can be prevented. Winsor et al, 2004, presented a study, which reported that 50% postpartum depression cases go undetected or remain unnoticed. Where treatment is concerned, pharmacotherapy and psychotherapy together are considered effective as the first line of treatment for postpartum depression. Consuming antidepressants while lactating may pose health risks and developmental abnormalities in the infant and further research is needed for using the same. Payne and Jennifer in 2007 suggested that antidepressants be taken immediately post feeding, or soon after the baby is put to sleep to reduce exposure to these drugs, as far as possible. Primary care physicians, pediatricians, psychiatrists, medical counselors and gynecologists, the new mother and her family members can prove to be a great interdisciplinary group to work out a treatment plan and approach, to understand and manage postpartum mental health. The stigma to accept and agree to counsel for a mental illness is also an issue that causes most postpartum depression cases to remain suppressed. O'Hara, M. W. (2009). Postpartum depression: what we know. Journal of clinical psychology, 65(12), 1258-1269. Musser, A. K., Ahmed, A. H., Foli, K. J., & Coddington, J. A. (2013). Paternal postpartum depression: what health care providers should know. Journal of Pediatric Health Care, 27(6), 479-485. Dennis, C. L., & Chung‐Lee, L. (2006). Postpartum depression help‐seeking barriers and maternal treatment preferences: A qualitative systematic review. Birth, 33(4), 323-331. Bilszta, J., Ericksen, J., Buist, A., & Milgrom, J. (2010). Women's experience of postnatal depression-beliefs and attitudes as barriers to care. Australian Journal of Advanced Nursing, The, 27(3), 44. Leung, S., Arthur, D. G., & Martinson, I. (2005). Stress in women with postpartum depression: a phenomenological study. Journal of Advanced Nursing, 51(4), 353-360. Bennett, S. S., & Indman, P. (2003). Beyond the blues: A guide to understanding and treating prenatal and postpartum depression. San Jose, CA: Moodswings Press.